I've successfully not bought any bread for over a month! I've kept strictly to baking my own bread, which has been something of a learning experience. But the results I've enjoyed from letting the dough do its first rise for 24 hours in the fridge has given me plenty of delicious loaves to not go back to store-bought bread. Now I just take it out of the refrigerator on the second evening, allow it to warm up and rise again for 2-3 hours, then bake it as normal. A nice hot slice of buttered bread as a bedtime snack, then it cools on the counter overnight. One evening's bread had the most unusual tang to it, akin to a good sourdough. Not sure of the cause, I took a sip of my kefir and suddenly made the connection. I remembered the night before I was out of whole milk, so I used some kefir instead. A fermented milk drink, kefir gets its tang from the action of a living mass of bacteria and yeast. I pour this jelly-like mass into a mason jar of milk and allow it to ferment for one or two days. Apparently that acidic tang carried over to the bread, giving it the sourdough-esque character. As much as I enjoy fermenting on my own (cabbage into sauerkraut, malt into beer, etc), I though why not try to cultivate wild yeast for my own bread? 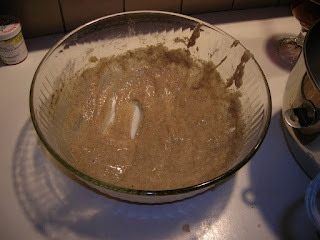 My Time-Life Bread cookbook contained a recipe for cultivating wild yeasts, which was the basis for this experiment. To start, a boiled potato was mashed in a bowl with flour and sugar, then thinned out into a dense batter with the potato's cooking water. This starchy medium would act as a feeding ground for wild yeasts in the air to come in and set up camp (basically a petrie dish). The bowl was then covered and put in a warm spot to ferment for three days. Once it was bubbly and sour smelling, the mixture could be refrigerated for two weeks before use. 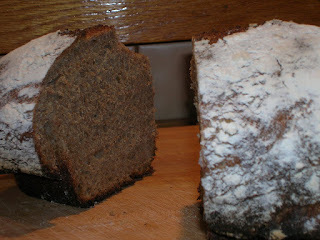 I made my starter with a bit of rye flour, as I enjoy the nutty chewiness of a slightly musky rye sourdough. Three days brought the foretold bubbling and sour smell, so I made my bread. The recipe yielded what I think is a rather handsome loaf, with a dark, dense flavor. One thing to note is that regular bread yeast is still used, since wild yeast cultures are still unpredictable and may not make the bread rise at all. 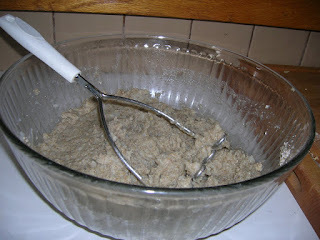 So the wild yeast gives you the backbone of flavor, with cultivated bread yeast supplementing the rising of the dough. Upon tasting, the bread did have a full, tangy flavor, indicating my starter had worked like a charm! Part of me was expecting a more intense sourness, however, as the bread was at the level of a regular bakery sourdough. This may just be the action of the yeast in my local area. To put my wine-speak hat on, I had pushed the yeast of my geographic terroir to their limit. Probably why areas like San Francisco are so famous for the sourdough they create with their area's local wild yeast. Or why Belgium's local yeast is the reason their sour lambic beers can be so successfully fermented by just exposing them to the night air. 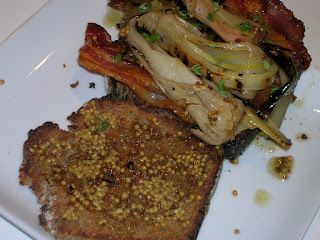 Ah well, my terroir yeast still made for a tasty sandwich of bacon, leeks, and mustard. And isn't that what really counts?